I’ve found a surprisingly easy way to tell if an app from iTunes for the iPhone or iPad is going to take too much time to play and won’t be any fun. Just check out the “Top In-App Purchases” levels. If the top tier is over $10, you’re not going to enjoy playing that game if you have a full-time 8 AM to 5 PM kind of job. 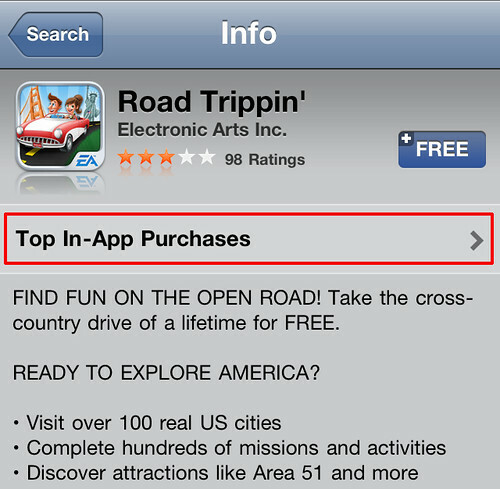 Take, for example, EA’s latest offering… Road Trippin’! Looking at the app listing in iTunes, everything seems all Smurfy-Happy-Blue on top. But if you look off to the left column, under the FREE APP button (or DOWNLOAD button if you’ve already grabbed the app before), there’s a section called “Top In-App Purchases”. $99 dollars and 99 cents. Almost half the price of a console system! Just so I can play with “everything” this “free” game offers. You don’t have to be in iTunes to see this. You can also find this info under the iPhone and iPad section of the game app by clicking on the “Top In-App Purchases” banner…. …where you will see the same $99.99 foolishness. “In-App Purchases” are just things you can buy while playing the game to move along faster, or just get those missing “propeller-for-the-damn-airplane” kinds of parts and those oh-so special “air-strike to get that pickle-faced rat bastich sniper that’s been nailing me for the last three days” kinds of options. 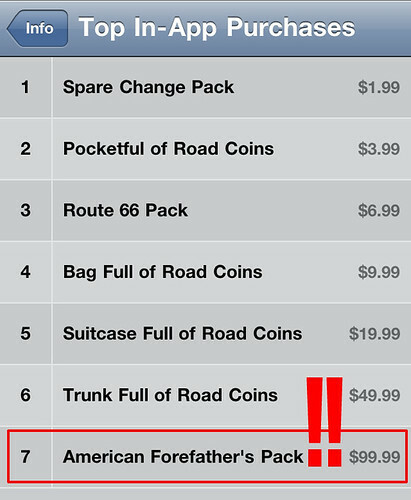 Do you need to make in-app purchases? No. You can slog through the game, playing hours and hours and hours and hours on end just to nickel and dime your way to nirvana. No more “sneaking-a-game-on-the-freeway”. No more hanging up on someone just because a pop-up from the game appeared. But, in my experience, playing games like this take months to “win”. The wheeeeeee-fun part ends around day 12. The Spirit of Piss, Vinegar and Vengeance kicks in around day 21. The more iOS games I play like this, the more I realize most of the “In-App Purchase” games are basing themselves on the good old Las Vegas slot machine business model. Put some money in the system. Watch the beep-boop flashing lights. When a game company has priced the top-tier of their In-App Purchases insanely high, in my opinion, they’ve made the game overly hard and time consuming on purpose to get you hooked and make a grab for your money. I’ll stick to the games without the in-app purchases banner. If a game does have in-app purchases, I’ll only install it on my device if the top tier is $10 or less (or to unlock the full-version of the game). Like the old Vegas motto says… the easiest way to win these $100 games is not to play ’em. This entry was posted in iPad, iphone, Rant, Tech! by admin (Royce). Bookmark the permalink.